Jimmy crack corn and I don’t care. Fathi’s orchestration of sound is masterful and complicated, not unlike the contents of her poems. For example, while reflecting upon all that happens within the first three lines of this opening, untitled piece, we might ask ourselves, why “Jimmy Crack Corn”? This tune, also known as “De Blue Tail Fly,” has less-than-straightforward roots. While many readers might nestle into the memories of their childhoods, then be immediately shaken by the third line, even the song choice is infused with complexities; the origins are somewhat undetermined, but may have been rooted in blackface minstrelsy. Perhaps these first lines are a warning to heed, one regarding the intricate layers of the collection. Nothing is forbidden, yet nothing is damaged, or perhaps everything is cherished, but also broken. It’s difficult to say. Regardless, each element is handled with the care of an old, almost-omnipotent soul. 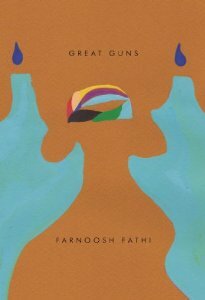 This title poem, “Great Guns,” weaves together personification, chremamorphism, and somehow even a mixture of the two techniques, which perhaps refuses to be defined. For example, “The great guns of a lover— / his sweat broke into ants that led the other way” (8). Yes, we desire this iris, but do we yearn for it as a flower or a paintbrush? We long to create a crescent, both an n and a u, two shapes that are identical yet opposite. Perhaps more than many other recently published collection, Great Guns feels, to me, reminiscent of its predecessors. While reading the title poem, I find the fluid, spreading lines, as well as the way in which the speaker celebrates her lover through and among the natural world, to nod quietly toward Walt Whitman’s Leaves of Grass. Upon completing “Iris,” I am both quietly satisfied in thought and also wish to revisit Jorie Graham’s early Hybrids of Plants and of Ghosts, including “Penmanship.” Regardless of Fathi’s intentions, it would be difficult to debate that she isn’t an incredibly well read poet and an astute scholar. I do not by any means intend to oversimplify or sterilize the accomplishments of Great Guns. Quite the contrary, it’s hard to believe this is Fathi’s debut collection. The poems manage to demonstrate the sage-like steadiness of a storyteller, yet, rather, are hauntingly lyrical. Each line glides, as if water slipping pleasurably through our fingers and then back into itself, as something we can’t quite grasp or keep. Nevertheless, Great Guns is certain to change – quite possibly deeply change – its readers for the experience. Heather Lang is a poet and critic studying with Fairleigh Dickinson University’s MFA in Creative Writing program. Her poetry has recently been published by or is forthcoming within The Del Sol Review, Green Humanities, IthacaLit, Jelly Bucket and Mead. Her reviews have been published by or are forthcoming within Atticus Review, Gently Read Literature, HTMLGIANT and Prime Number Magazine. Heather serves as Assistant Editor for The Literary Review.